KENKI DRYER which uses International Patented Technology can dry sticky, adhesive and viscous material containing high moisture contents and liquid material that no other company can deal with. It can dry without clogging inside of the dryer and with safe operation which meets no operational trouble. 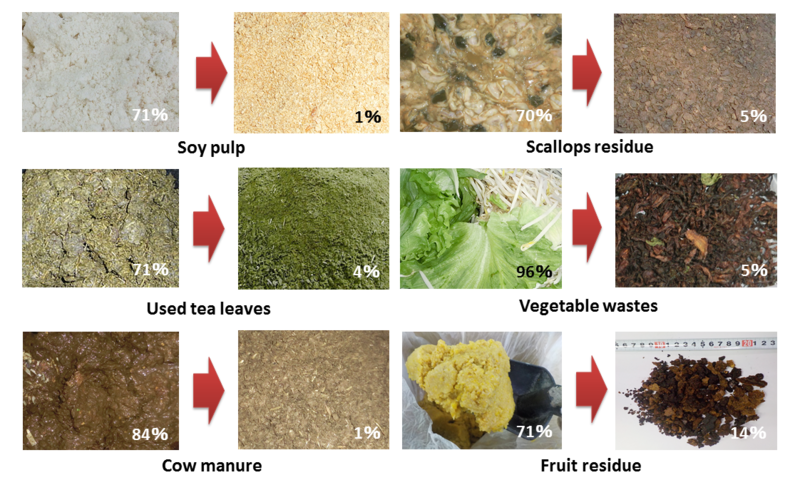 Organic wastes with high moisture contents such as coffee grounds,used tea leaves, soy pulps, livestock excretions, food residues, vegetables, fruits scraps, residues of processed marine product, etc. can be dried smoothly and each of these materials are discharged as valuable product with stable quality after drying. Saturated steam is used as a heat source, and materials are dried with low-temperature and with unique and effective drying mechanism based on combined use of conductive heat transfer method and heated air method. No other dryers whose heat source is only saturated steam has this kind of mechanism. Because of its low-temperature drying, it can heat and dry without changing components of materials even the material is organic waste containing high moisture content. The output can be used for various uses such as fuel, fertilizer, soil conditioner, feedstuff, etc., and in some cases, it can be sold with high price and can contribute to the environment as well. Also, organic waste with high moisture contents can be decomposed pyrolytically by using our pyrolysis product of Biogreen after drying with KENKI DRYER, and gas, oil and biochar can be generated by this process. It is possible to sell steam or electricity made with gases, and the biochar as fuel or soil conditioner. Because of low-temperature drying, components of material to be dried are hardly changed and the output can be used for various purposes.